Encourage your customers to share their experience in reviews and reward them with special offers. It’s not a secret that a huge number of customers make their choice based on other consumers product experiences. Customer reviews are objective and sincere, and for that reason highly-trusted. 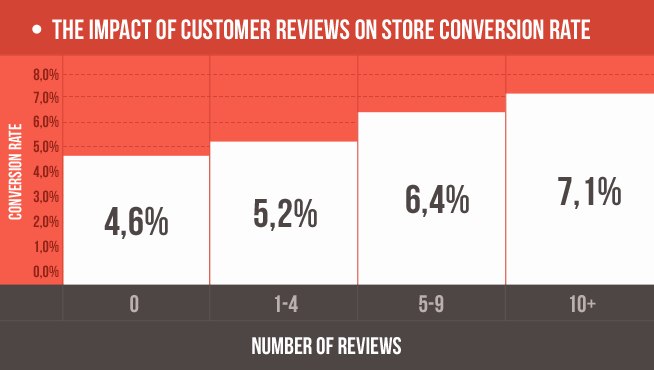 Reviews and ratings can boost your store conversion rate more than other well-known marketing tools. Just collect them and display on your e-commerce site with the help of Reviews Reminder Magento extension. Stay in touch with your clients to better understand their needs and preferences. Many buyers are impatient to discuss their experiences or may have questions. Customers’ feedback helps you to learn which business areas need to be improved. Review Reminder extension enables fully automatic review request generation and dispatch, that of course, saves much of your time and energy for other business tasks. You just need to configure the parameters of a built-in email template and the reminder is ready to dispatch. Now you can send all pending emails at once - just select the emails you want to send and apply ‘Send’ action in the queue grid. With Review Reminder for Magento you can set up the delay period between the order and review reminder (e.g. 5 days after order). To effectively manage your discounts enable customers to use coupon codes added to reminder emails only after their reviews are approved by store administrators. Reward your customers with discount coupons. Apply automatically generated coupon codes in your review reminder letters. You can easily send a test email to the appropriate email address to make sure that everything is alright. Try a selective approach to sending email reminders. Send emails only to customers with particular order statuses. Editable html template enables you to fully customize the email styles and content according to your goals. The Reviews Reminder settings allow you to choose the required email sender, for example sales department, customer service, etc. 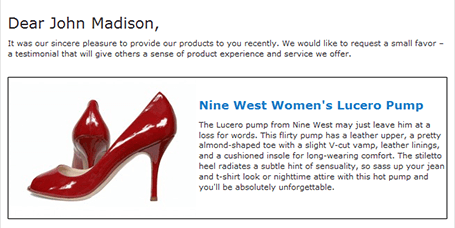 Deliver reminders only once for a certain product to the same customer. In case a customer has bought the same product several times, he will get only one review request. If you don’t want to create a displeased audience, you should allow your clients to unsubscribe from getting your emails. You can easily do this just placing the unsubscribe link in the footer of your email. Create the black list to stop sending emails to unsubscribed or unwanted customers. Otherwise, you might lose them forever. Add the auto login link to your email template. In this case, your registered customers will be logged in to your website automatically. You can allow emails sending only to the subscribed customers. Thus, you'll likely get a feedback as the users don't mind receiving a newsletter. With the help of Review Reminder Magento extension you can keep a track of review reminders through email log and easily monitor a reminder email status: pending, sent or opened. Using Review Reminder extension for Magento you can track all clicks on the email links due to Google Analytics. With this useful option you can get the statistics of your emailing efficiency. After Reviews Reminder extension installation you won’t have to wait for new orders to get the first feedback. You can send reminders to customers, who already bought from you. Just specify the retrospective period (e.g 2 weeks before the current date) and send reminders to customers who have placed orders during the time. With the help of another Amasty free module - Reviews Sidebar - you can select and show your clients only positive reviews, for instance, with rating no less than three stars. The block with reviews is easily customized to be compatible with Magento themes. You can indicate how many words from each review should be displayed. What happens when there is an order with more than one product? In this case a customer will get 1 email with multiple links to leave reviews. Should a customer have an account in my store to get a review reminder? With the use of the extension, you can also get guest reviews, as the module can send emails to guest users as well. Yes, it’s definitely possible with the store review extension using the 'Generate Reminders for Last (days)' option. To see all the settings read on. This is a wise decision since you are ready to give a discount only for a review. There is an option to activate a coupon code only after the review is approved and published and send a notification. Go on reading to learn how to activate the option. Are there any ready reminder templates? Yes, there is a default product review email notification template which you can use to send review reminders to your customers in System > Transactional Emails. You are free to customize this template or create new ones. Can a review reminder be sent automatically once the order status is changed to “completed”? Yes, of course. A product review notification can be send automatically, which is one of the core features of this extension. Yes, there is a special option to add UTM tagging to the product URLs found in review reminders. Read on to see how to set the option. Like everything with Amasty it works great and they had the best help with setting everything up! I am very satisfied. Support is great, solved my problem in few hours - it was probably my fault and they correct it. Thank you! The extension is very well written. I customized it to add some more parameters in the reports section (showing who actually wrote the reviews) and an automatic thank you email after the customer writes a review - maybe you guys should add it too. I have setup your extension success. However I meet a big problem, your extension don't check products before send review reminder. I have very much old orders with products no exits in my system. When you send review reminder, you don't check again product. For this problem, i advise you do checking. If products in order no exits, you don't allow send review reminder on this orders. Please fix this problem now. I decided to write this review without any reminder, but I do know that customers usually refuse sharing their opinions... especially positive. That's why we purchased this extension. As we expected, it started working right out of the box. The email template was easily modified according to our needs, and now everything works like a well-oiled machine. I'd recommend this app to everyone who wants get more product reviews and sell more products. This extension is really helpful for my store. D ue to my niche (specific agricultural equipment), it’s hard to get customers leave testimonials. They need time to check if the equipment works as they need, it may take a few months. So most customers forget to return to my store and leave their opinion. That’s why I’m happy that there are such extensions that can remind people to come back and leave reviews. The extension was installed quite fast (I chose to use Amasty installation service), I just configured the settings and changed the email template a little bit. For 3 months of usage I got more reviews than for 6 previous months, I’m really impressed! Thanks. The installation of this extension went smooth. 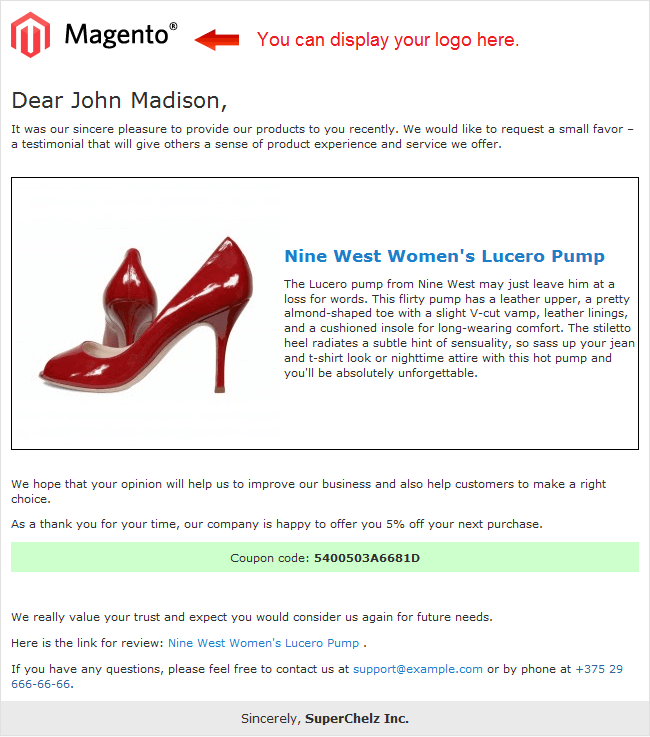 We tested it at first on our small email lists to ensure the extension works properly. After that we emailed all our customers and promised a discount for leaving reviews. Many of them really returned and left reviews. I’m happy that worked. Reviews create trust – and that is what we need. Being an ecommerce newbies, we always start with simple tools. So, before launching a massive email campaign sending different types of follow ups, we installed this extension to try the way they work with reviews. It's too early to evaluate its marketing effectiveness, but it definitely works as described. Due to a detailed manual we managed to specify all the settings. The ability to send test emails is a great plus! I hope in the nearest updates they'll add more ready-to-use templates. question on how to make cron work, big thanks to support for helping me on this. It can also automatically send discount coupons in your email which is a very useful feature, it motivates people to write more reviews. No troubles in sending email. – Fix: issues with emails queue was fixed.